Yesterday I had my one day off of the week. We got the first bus into Bayonne, and it was definitely worth the hour and 45 minutes of feeling like I was about to throw up. We got there for the end of the race which goes from Biarritz to Bayonne, and had the privilege of watching the making of the omelette. 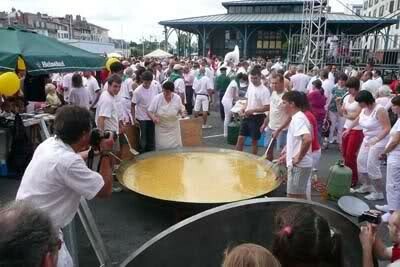 They make a massive omelette (6 foot diameter) and everyone who runs the race gets to eat some. Otherwise, you have to catch a plastic fish from a paddling-pool to get some. It didn’t look too appetising, so I would assume it has more token value than anything else. … and yet still managing to be classy in a way Brits would never manage. I’ve started this post in a seemingly irrelevant manner because the point of Les Fêtes de Bayonne, and of the red and white, is to celebrate Bayonne, and the Basque region – which wants to be independent from both France and Spain. They have their own language, Basque – a language isolate, meaning it doesn’t seem to be related to any other surviving languages. For this reason a lot of linguists study Basque. Little is known of its origins, but it’s thought to be the only remaining pre-Indo-European language. Stepping back from my day off in Bayonne, Basque is not promoted by the French government. The Scottish government, on the other hand, seem to be fighting a losing battle to revive Gaelic in Scotland. Les Fêtes de Bayonne were fantastic. Everyone was in the spirit of the day; happy, helpful, patriotic, drunk. This scale of things could not happen in Scotland. The areas where Gaelic is still spoken are generally very isolated and sparsely populated. 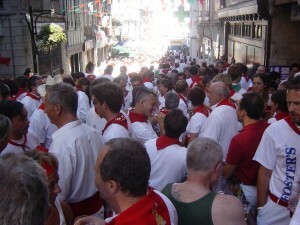 A festival of the scale in Bayonne would not be feasible. The Scottish government may be fighting a losing battle, but the French government is not. L’Académie française is a government body who try to preserve the French language in all its glory. This means stopping people from using words they ban – mostly English loanwords – but also stopping people from using slang, dialects, and other languages. Basque has little chance. Gaelic was never spoken in Edinburgh. Don’t try and “revive” a language in a place it was never spoken. They’re doing this for tourists, not for locals. Neither Gaelic nor Basque have died out, but they’re pretty close, and there’s a reason for that. As much as I’m saddened by the idea of a language dying, languages are for communication. When a language is no longer good for what it was made for, why should it survive? I think that it’s beautiful that the Scottish government are doing all they can to revive – or sustain – Gaelic, but once the number of people who speak a language is too small, once another language is prevalent in the area, and once people who don’t speak this other language will find it hard to find jobs or survive in the world beyond their village, the language will not survive long. Perhaps the numbers of people who speak Basque (714,136 compared to 58,652 Gaelic-speakers in Scotland) would allow them to sustain the language, but with the government doing all they can to subdue them, they don’t stand much of a chance. Great post! It is a terrible thing when a language is lost, but you’re right, if it isn’t being used there is no reason for it to exist. Unfortunate, but true. I agree with that. As what Richard Dawkins say, even language is subjected under the influence of something like the natural selection. Mmm… I’m not sure I agree with your comment the Basque language is “pretty close to die”. I’m not familiar with the situation of the Basque language in France but I know a little bit how it works in Spain where Basque is a recognised language. In fact, Spain has 4 official languages: Spanish (official in the whole territory) and Galician, Basque and Catalan (co-official with Spanish in their own territories, i.e. Galicia, Basque Country and Catalonia). In Spain children learn Basque at school (ikastolas) if they live in the Basque Country. There is a small cinema industry producing films in Basque (some of them made it to international festivals). It goes without saying there are TV channels which only broadcast in Basque, some of which can be seen outside the Basque Country. Politicians in the Basque country use it in their exchanges in the region and some of them even use their (constitutional) right to use an interpreter in the rest of the Spanish territory. Outside this “autonomous community” (as regions in Spain are called) it is also possible to learn Basque in places such as the Escuela Official de Idiomas, provided there is enough demand for it (e.g. Madrid). What is more, if things haven’t changed since I last tried a few years ago, if you want to work in the Basque country it is compulsory to know Basque. Otherwise, you are out of the game. Thus, from what you are saying (don’t know enough about the Gaelic situation in the UK) I don’t think it’s fair compare the Basque language with Gaelic. The Spanish Government may not be promoting the Basque language (the Basque Government certainly is) but it’s not like in Franco’s time either, when it was forbidden. Thanks. Very informative. What kind of shows are on Basque tv I wonder. What are some of the films? http://www.tveuskadi.net/en/ (this came up on my Google search whilst looking for the previous one, so not sure it they only broadcast on Internet). As for the movies, I know of Ander (http://www.imdb.com/title/tt1351734/) and For 80 days (http://lumiere.net.nz/index.php/outtakes-2011/). They have been both shown in International Festivals. Julio Medem, one of the best-known Spanish film makers in the country, is Baque and sometimes films in Basque. Hopefully the films have subtitles in French or English. Thanks for all the links! Wow! Obviously from this side of the border I’m not seeing this side of things – plus there are fewer speakers in France than in Spain. I’m so glad something’s being done! Well done. In my country (South Africa), the Afrikaans community is worried that our language would die out. We have 11 official languages. English is used mainly in business and to communicate across the cultural groups. If the Afrikaans people (my ethnic group) is worried, I wonder how the different local black communities feel about their languages surviving in a fast growing global village? If it’s validity then why is Scots only used in jest? 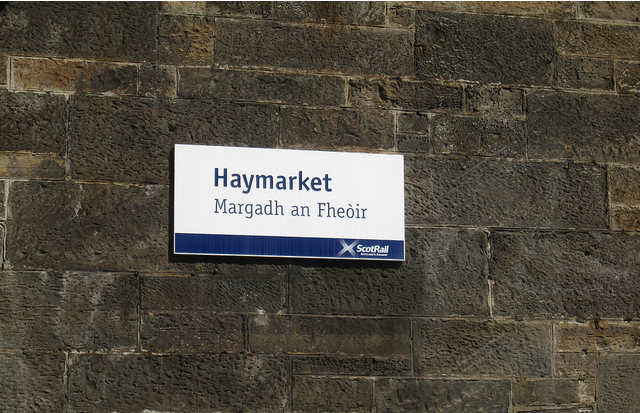 Scots was the language of parliament once, but the government today would not consider putting Scots words on signs. It’s not as pretty as Gaelic, and it also has a shadow of being invalid because people view it as “slang”. It is, however, much more a part of the culture and history of many areas of Scotland, such as Edinburgh, than Gaelic will ever be. I think that’s a VERY general comment with limited understanding of linguistics. I would invite you to read works by Billy Kay and Jo Arthur Shoba. I am a fluent speaker of Gaelic and Scots and can tell you that if you’ve spent an hour in Glasgow or an hour in Skye you can see that neither language is used in jest. Labov, from the University of Pennsylvania also has a myriad of articles on non standard language. Furthermore, “It’s not as pretty as Gaelic,” is surely a subjective statement that no logic can satiate. I just reread your comment and wanted to add to your sentiment. First, Scots is as valid as English AND Gaelic. I agree that it should not be frowned upon, but your lambasting of Gaelic doesn’t give your argument any more credence. Because Scots is so closely related to English (though it IS a separate language), it IS often looked at as a bastardized version. It will take policy to improve its image. I agree that the local areas should define the language of use in education and government; however, legitimizing Gaelic throughout the country will not be something that FORCES its use. I see nothing wrong with it. I think a separate movement encouraging the use of Scots is due as well. I’m all for a movement encouraging the use of Scots (although by “use” I mean official use, it’s the most widely spoken language in Scotland). But introducing a language into an area where it has never been spoken seems ridiculous to me, and it’s something I will never understand. Also, I live in Glasgow, and am a fluent and proud speaker of Scots! Interesting post! Just a couple of comments. -The Académie française is not the all-powerful machine you seem to believe it is. It is a government agency, yes, but all it does is make recommendations that government employees are supposed to follow in official communications. Everyone else is free to use the language how they see fit. -Also, it’s not really fair to say that the government is “doing all they can to subdue Basque speakers”. Basque is not banned in France. It does not have official status, true, but there is a large space between “not being official” and “persecuted.” You have to keep in mind that France has many regional languages calling for “promotion” (which can be very costly) and only so much money in the national budget. Also note that there are many French people who fully support the current French-only laws, because they feel it adds to national unity. -Contrary to what is often reported, only a small percentage of French Basques actually want independence. I can’t speak for Spain, where they seem much more hostile to the central government. There are more Basques in Spain than in France, and so the Basque-independence movement from that side is much stronger. Comparing the UK government’s approach to Gaelic, Welsh, Manx and other regional languages and dialects, France and Spain’s decision to not promote a language seems to me to be as good as persecuting it; in having only the French or Spanish place name on sign posts or not translating things into Basque, they are making it impossible for Basque to be the thriving language it could be.